The U.S. labor market is rocking despite the recent slow down in global growth. The number of jobs, the number of hours worked, and the average hourly earnings are on the rise and point to one thing, consumer health. This is the sector you should buy to ride this trend. A bonus; My latest stock pick capitalizing on labor and earnings trend. The U.S. labor market is rocking despite the recent slow down in global growth. The data shows clear expansion within the market, an increasing number of hours worked, and moderately strong inflation in wages. This combination is fueling strength in the consumer that has yet to be unleashed. The March non-farm payrolls report says it all. 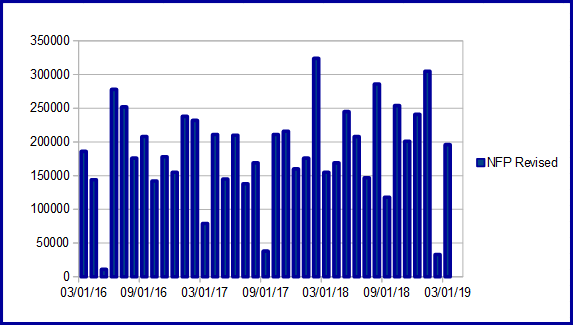 Average job gains over the past twelve months, even with the weak February read, are still running above 150,000, wages are growing above 3.0% YOY, unemployment is hovering at historic lows, and there is no sign employers are cutting back on hiring. Both the ISM services and manufacturing surveys indicated an uptick in hiring over the last month. The employment sub-indices of both gauges have been trending above 50 for more than two years and made a nice advance in March. 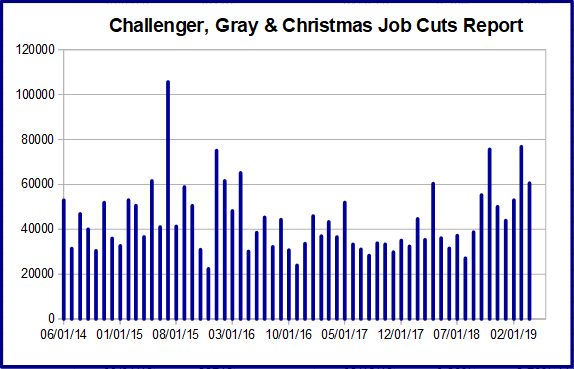 The Challenger, Gray & Christmas report should be noted because it shows an elevated number of job cuts relative to the past few years. 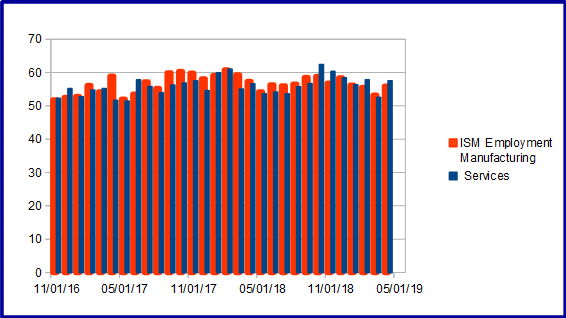 The mitigating factor is that nearly 50,000 of this years planned job cuts are due to restructuring which is otherwise a positive for business and the economy. Based on the JOLTs report plans for hiring far outpace plans for job cuts, and far outnumber the number of unemployed Americans. At 7.58 million the number of open jobs in America is the highest its ever been and assures demand for employees long into the future. That demand is evident in rising wages, benefits, and sign-up bonuses intended to attract new talent. The KC Fed's Labor Market Conditions Index is throwing a cautionary signal but not one indicative of a recession. The activity index, a composite of 24 sub-indices, rose to 0.96 from 0.86 in February and is trending at a long-term. The amount of momentum decline but momentum remains high relative to trend. While momentum has been slowing it still well above historical norms and suggests activity could continue to expand for several more YEARS. 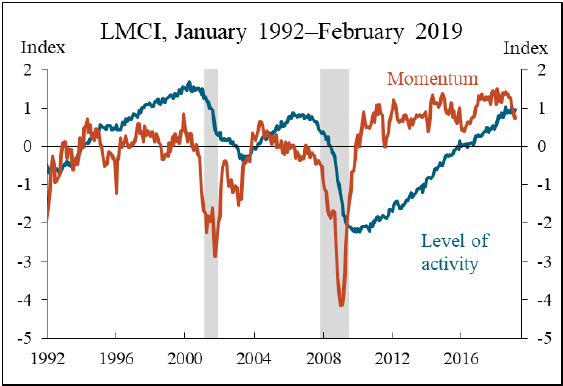 Based on this months labor data I expect to see the LMCI tick higher in March as well. The estimates for 2019 retail sales expect to see some cooling in the market. That said, retail sales are expected to grow +4.0% this year and those estimates are likely low. Both Kiplinger and the NFR are basing their estimates on 1st quarter conditions and before the last round of ISM figures. The unexpected strength in both services and manufacturing, coupled with strong labor conditions, points to increased spending this year. When it comes to investing in the consumer there are really only two choices; staple (XLP) and discretionary (XLY). While the consumer staples sector may seem like the better choice in today's atmosphere of uncertainty, the earnings estimates tell a different tale. Both sectors are expected to produce negative earnings growth in the first quarter, about -4.5%, and both are expected to return to earnings growth by the next quarter. Both are also expected to accelerate earnings growth into the end of the year and next year but the staples are only looking at 1.2% growth this year and 7.0% growth next year while the discretionary sector is expected to more than double those estimates. To further highlight the difference in outlook, the discretionary sector is expected to be the second strongest performer in terms of earnings growth, leading the market, this year and next. The staples sector is expected to lag the broad market this year and next. From a chartists perspective, the XLY Consumer Discretionary SPDR (XLY) looks quite strong. The ETF is moving and extending its Vee-Bottom reversal that formed at the end of last year. The move is supported by bullish indicators and rising momentum. Now that the ETF is testing resistance at the all-time high a consolidation or correction may form but any weakness is a likely entry point. Estee Lauder (EL) is listed as a consumer non-cyclical but let's face it, beauty and cosmetic products may be a "staple" but also offers plenty of opportunity for "discretionary" spending as well. Estee Lauder has been growing earnings steadily in the mid to high single-digit range since the first quarter of 2016. 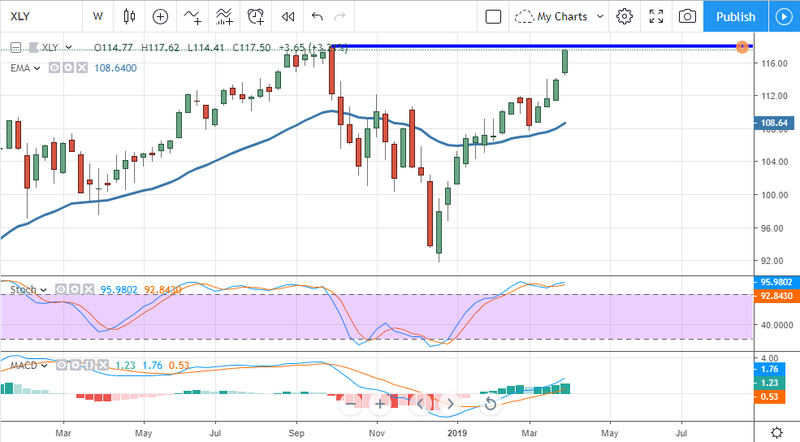 Earnings growth peaked out in the second half of last year along with the broader market but still expected to grow this year and next. At the last reporting, Estee Lauder delivered net revenue growth of 11% on strength in emerging markets and Asia/Pacific. This produced a solid beat on the bottom line (100% EPS surprise rate for the last two years) and led management to increase guidance. Guidance for this year is 5-6% net revenue growth and EPS in the range of $4.92 to $5.00. Since earnings were released the stock has received 20 upward revisions and only 2 downward. JP Morgan issued the most recent upgrade, to buy from neutral, after analysts at the investment bank attended the investor day event last month. The analyst team says it is confident the company will be able to hit its financial targets and raised their price target to $175, a 7% upside to today's prices. Calendar 1st quarter, fiscal 3rd quarter, earnings are due out in about a month. The stock only yields about 1.0% at these prices but the payout ratio, about 35%, and a modest history of dividend increases mitigate that fact. The yield may be low but it's sustainable, accompanied by realistic revenue growth expectations, and a high probability of future dividend increases. The bottom line is this; labor markets are strong and that strength is aiding the consumer. Consumer health is leading to modest increases in YOY retail sales growth estimated at 5% for this year. 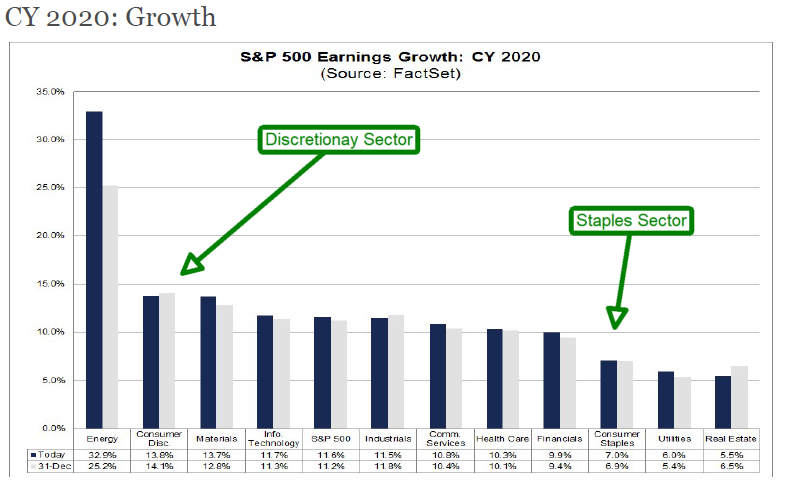 In terms of earnings and earnings growth both the staples and cyclical discretionary sectors are expected to produce positive results, the discretionary sector is projected to do much better. The XLY is my pick among ETFs to ride out these trends, my bonus stock pick is Estee Lauder for looking for another avenue. Disclosure: I am/we are long xly, xlp. I wrote this article myself, and it expresses my own opinions. I am not receiving compensation for it (other than from Seeking Alpha). I have no business relationship with any company whose stock is mentioned in this article.